Scratch and Win! Customers will be itching to get their hands on your custom designed drink coasters when there’s a prize at the other end. Boost sales, build customer loyalty, and promote your business with this insanely effective marketing tool. Perfect for increasing consumer interaction across multiple platforms, Scratch-N-Win Coasters can be used for a variety of purposes and will increase your website traffic and email database. What are Scratch and Win Coasters? What are Scratch and Win Drink Coasters? Scratch and Win Custom Designed Coasters are drink coasters with a difference. With a Scratchy coaster, you can invite potential customers to have a fun and interactive experience with your business. When coasters are used at pubs, cafes, hotels, or restaurants, research shows potential customers have your brand in front of them for an average of 45 minutes. 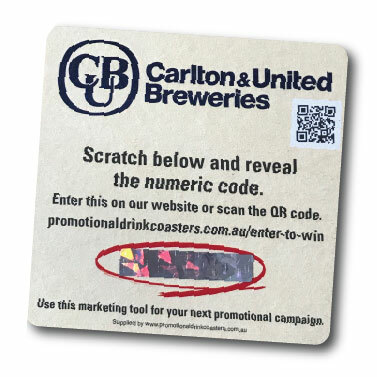 Because you’re adding a competition element to a custom designed drinks coaster, your potential customer can’t help but engage with you and scratch their unique code to see if they’ve won a prize. Thanks to everyone having their smart phone with them at all times, you can immediately send them to your website, App or Facebook Page and validate their code (or confirm their instant win / enter their details into your database). Our in-house graphic designer will help you with your artwork and design. We have state-of-the-art technology onsite that means we do all our printing and coaster delivery to you from our Australian headquarters. There are many ways to distribute your drink coasters, depending on the nature of your business. This is the easy part – the customer or prospective customer does all the work for you. They pick up the coaster and read your offer. Then they scratch off the grey seal to reveal their unique scratchie number, and depending on how you want to run your promotion, enter this number on an entry form on your website or get an *Instant Win* that they need to go to your website to retrieve. This achieves one major goal – regardless of whether the customer enters the competition. They have visited your website! This creates some familiarity with your business, your brand, your products and services. They’ve seen some of your offerings, and maybe browsed around a bit. And if they did enter the competition, then you have achieved your second goal, which is . . . They have added their email address to your mailing list! This is important because you can then do followup marketing which entices them to “Know, Like & Trust You”, which leads to them “Trying and Buying”, and ultimately to “Repeating and Referring”. This is the perfect marketing strategy. Then you show them a web page that announces their win and advises them how to collect. All managed behind the scenes by the changes that we can make in your website. Then you show them a consolation web page that may have a simple marketing message on it. Because you have achieved they’ve visited your site and been added to your mailing list. We have specialist technology onsite and have developed our Variable Data Scratch Label Applicator Machine to do all the hard work for you. Our machine allocates unique numbers (or a unique combination of codes and letters) to each coaster and has the technology to choose winners as directed by you. The visual reader on our machine makes sure the right code is allocated to each coaster before the scratch label goes on. You also have a choice of colour for the scratch panel: traditional silver, or a holographic colour, that really makes your promotion stand out. An example of this is on the CUB coaster below. CLICK HERE to test the system. Talk with us now about how to get started.